Until early December 2015, I worked at the Driver and Vehicle Standards Agency (DVSA). I’m now a content designer working at the Government Digital Service on the GOV.UK website. 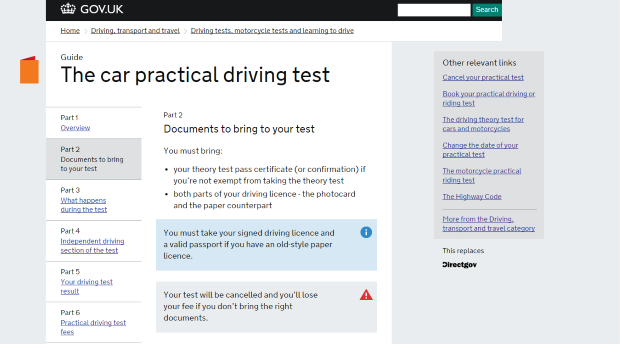 In one of my first tasks here, I’ve been helping to improve the information about the driving test on GOV.UK. We want to make it as simple as possible for people to find the information and services they need. I wanted to tell you a bit about what’s changed and why. We started by looking at feedback left by people who use the site using the ‘Is there anything wrong with this page?’ link at the bottom of each page. We also looked at what people were searching for, and how they moved between the pages of the site. As you know, there's currently a longer wait to get a driving test than DVSA would like. They’re working hard to reduce it. So more learners are looking to change their test when they’ve got it booked. 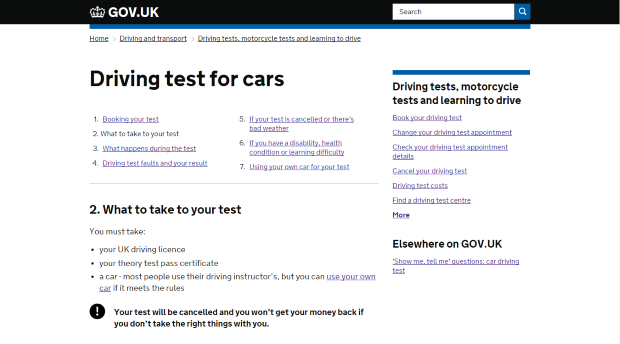 The page on GOV.UK and the websites that went before it have always been described as ‘Change your driving test’. But people aren’t searching for that any longer. They are, of course, searching for ‘earlier driving test’ or something similar. And the appointments that do come up at short notice are sometimes known as ‘cancellations’, so that’s a word being searched for too. 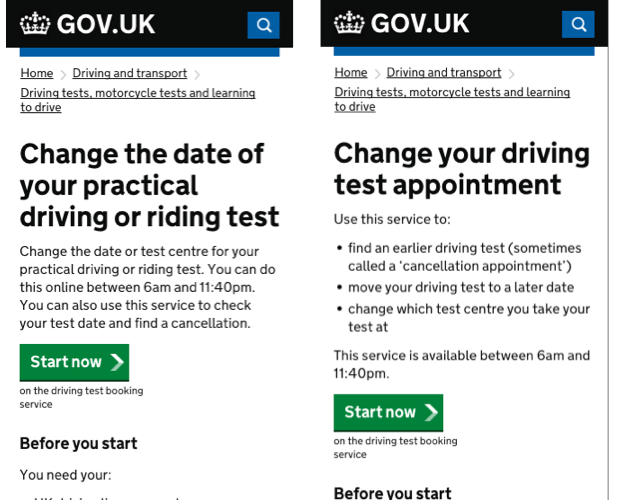 So we’ve changed the page at www.gov.uk/changedrivingtest to make it clearer that this is the service to use to find an earlier test (a ‘cancellation’). It should mean that this page appears higher up in search engine results for people wanting to find an earlier test. As we looked at how people were using GOV.UK, we found gaps in the information. Here are a couple of examples. People were struggling to find information about upgrading an automatic car licence to a manual licence. They weren’t sure if they had to take another theory test, or how to book the driving test. And what happened if they failed their test in a manual? Could they carry on driving an automatic? The information was all on GOV.UK, but scattered across separate pages. So we’ve published a new page about upgrading an automatic car driving licence to address all of these points in one place. As we looked at all of the data, we found people searching for what to do if they’d deleted their driving test booking confirmation email. The page about changing your test did mention in passing that you could use the service to ‘check your test date’ – but that was about it. So we’ve published a new page called check your driving test appointment details. We’ve made sure it’ll be easy to find for people searching for deleted or lost booking confirmations. And we’ve made it clear that you don’t need to bring the booking confirmation to your test. 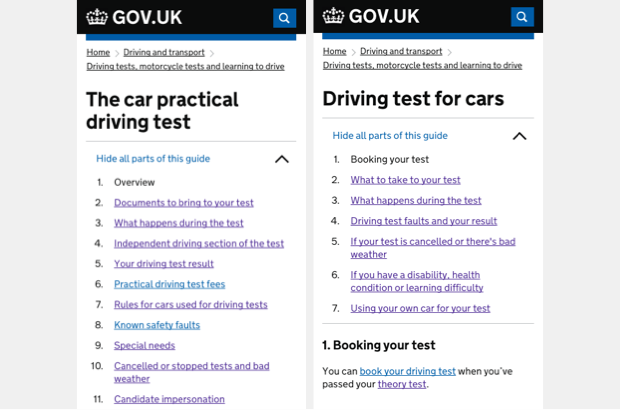 Just 3 years ago, 28.5% of people viewing the driving test guide were using a mobile phone or tablet. That's now at 62.0%. 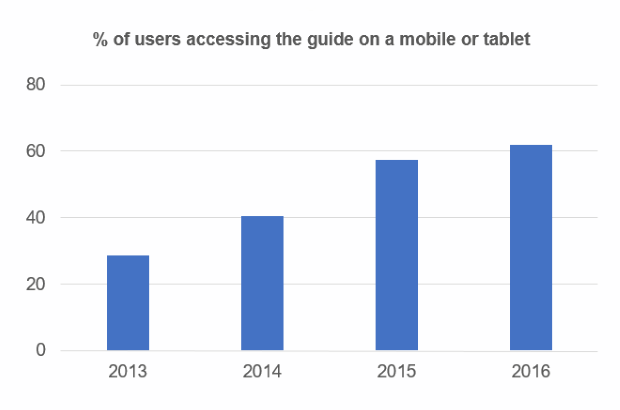 It’s not surprising that people reading the guide on a mobile phone use the guide differently to someone reading it on a PC. So we’ve reorganised the guide to make it easier for the majority now reading on a mobile. We’ve gone from 11 individual pages to read through, down to 7. So for example, the information about the independent driving section of the test is now with the rest of the information about what happens during the test. Another big change we’ve made is improving the links for this latest version of the guide. 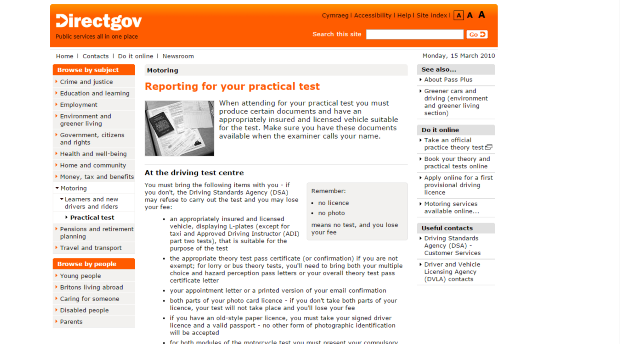 The driving test guide can now be found at www.gov.uk/driving-test. It’s easy to read, and give out to someone. It hasn’t always been the case. As an example, let’s have a look at how the link to the page about what to take to your test has evolved over the last 6 years. We always encourage people to link to the official services and information on the GOV.UK website. So if you have your own website, or just want to share the links on social media or write them down for your pupils, here are the most useful for the driving test. Why does the "what to bring to your driving test " still contain "theory test certificate" ??? The examiners no longer ask for the theory test certificate, and haven't needed to see this for the last 12 months or so. In 10 years, I don't think I've ever known an examiner ask for a theory certificate. "Making changes to help people get things done"??? HOW ABOUT SPENDING THE MONEY THAT'S BEING WASTED ON NUGATORY JUNK LIKE THIS ON RECRUITING MORE DRIVING EXAMINERS SO PEOPLE CAN GET TAKE THEIR TESTS?!? Simples! Then people won't need to waste their time on looking for cancellations several times a day for weeks on end. I can't believe that even an organisation as woefully inept as the DVSA have failed to get the point that people are sick of having to go through the rigmarole of dragging through the DVSA's long winded website process several times a day for weeks on end to find there's an even longer wait for tests. WHAT THEY WANT TO DO IS FIND WHERE THEY WILL GET AN EARLIER TEST & WHERE THE NON-EXISTENT MYSTICAL HIDDEN CANCELLATIONS ARE! Yes, people can't believe they don't exist. DVSA MUST STOP wasting resources on activities that nobody but they care about and focus on their primary objective of delivering driving tests within an average 6 week waiting time. Once DVSA can consistently deliver their primary objective then maybe they can enjoy a bit of bureaucratic play time. In 2014 to 2015, a total of 4,634 car driving tests did not go ahead because the candidates didn’t bring the right documents or a suitable vehicle. As this had cost each of those candidates £62 for the test that couldn't go ahead - over the year, this had totalled to £287,308. This amounts to 662 days of driving examiner time that couldn't be used, which in turn, puts back the date of the next available test for other candidates. This highlighted that some candidates were not clear on what documents they needed to bring or the type of vehicle they could use on test. This showed that there was a need to update the information on GOV.UK. I'm sorry that you think it's not worthwhile work. Just to be very clear, this work has been done by the Government Digital Service (where I work), and not DVSA. When we started the work, we looked at lots of data to find out what the problems are. This included things like what people were searching for, but also included things that actually happen at the driving test. One thing that we found was that in 2014 to 2015, a total of 4,634 car driving tests didn't go ahead because the candidate didn't bring the right documents or a suitable vehicle on the day of their test. As well as costing each of those candidates £62 for the test that couldn't go ahead (£287,308 in total), it's a test slot that couldn't be used. In total it's 662 days of driving examiner time that couldn't be used. Which puts back the date of the next available test for other candidates. So we hope that by improving this information and making it easier to find, it will save candidates both the cost and heartache of their test not going ahead. It should also contribute to the work that DVSA is doing to reduce waiting times. Impressive changes, well thought through: well done. As an adi who relies on my pupils to tell me their test date and time, I would find it extremely useful if a confirmation email could come to me as well as my pupil. Obviously, I would only expect this to occur with those pupils who have entered my adi number. This would ensure I get an accurate record of the event. I'm an ADI who would love to see that happen but I can't imagine that DVSA would go for it. Data protection law is the barrier. The contract for the test is between the DVSA and the candidate. There are circumstances where some candidates might change instructors just before the test and they may not want their previous instructor to know when or where their new test is. DVSA would have to be very sure about which instructor the candidate 'belongs' to and probably aren't going to risk passing on that information without the express permission of the candidate. The answer is to get your pupil to forward the confirmation email to you and if they don't then don't book it in your diary. When driving tests are booked by the people taking their test and they include the driving instructors ADI Number why can't a link be made to send an email to the instructor? Now that a lot of tests are booked by mobil there is no hard copy to show the confirmed test date to the instructor, also when a change is made the student 'forgets' that they have changed the test date, a link email to the instructor would be nice! I agree with jane Hinis, this would stop a lot of confusion on the day of tests , well done very good work . I agree with Jane Hinis comment above that would be useful. Likewise if their test gets changed or cancelled in any way. It's good to see changes have been made based on customer search data and behaviour on the site. Thank you for the links to put onto our own websites as I've had to spend time in the past searching for the best links to publish. I think it's wise to tell candidates to take theory test certificates as the need to present them seems to vary from test centre to test centre. Better to have it and not need it than risk test cancellation! I like these comments. This is a big ask as it will involve several government departments. Would it be possible to change how the driving licence number is presented on the licence card? I for one find it a pain having to count back eight digits. Having the last eight digits separated by a space will ensure the candidate and instructor gets this information correct. Cutting our administration time and be more efficient. What is the percentage of errors made for this issue? Good changes but when will we see the use of text messaging to confirm tests and for when tests are cancelled by the DVSA. This may help bring down the number of missed tests and is already widely used in the health sector for appointments.